I had some time last weekend to play around with the new Stamping Bella stamps I picked up while I was in Toronto on Thursday. I decided to play in my Art Journal. The stamps I used are the new Isabelle Norris Eclectic line of stamps that Stamping Bella released for April. I just love how cool they are! I also used some of my new Claudine Hellmuth paint I picked up at the store too! I LOVE, LOVE that stuff! How beautiful! I love the colours and hues of colours you have used - the card is simple and elegant and powerful. I really like it! Excellent job. 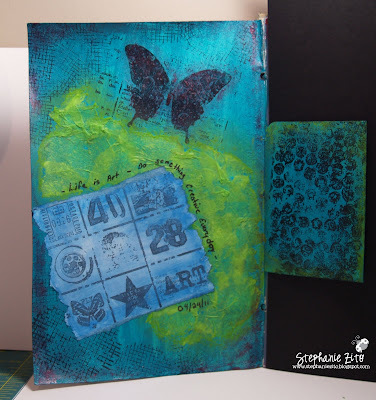 love the art journal idea. Sounds like some pretty awesome finds there.